Ready for an exciting chase guys? 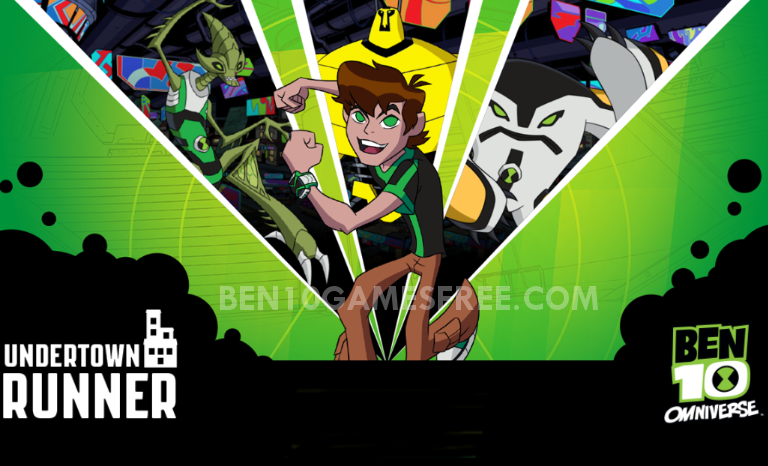 Here is the game called Ben 10 Undertown Runner. And you will be addicted to it once you start playing! Just run as fast as you can. Jump over the obstacles, slide under the gap and cross above the buildings. More distance you cover, more you score! Let’s check out all you need to know before starting playing Ben 10 Undertown Runner online. Ben 10 Undertown Runner is a classic running game featuring the underground alien city. Ben 10 has to chase and dodge all the fierce aliens and robots to make way till the end. In this Ben 10 undertown chase, you will have three aliens by your side – Crashhoppper, Cannonbolt and Armodrillo. As you know it is a high speed ben 10 running game, you need to go past all the obstacles in your way. Remember, Ben runs by itself, all you have to do is control him. Whenever there comes an obstacle, you will have two options to dodge them. First, by jumping over them and second by sliding under them. Ben 10 Undertown has too many scary creatures and to make things more difficult there will be buildings, gaps and uneven platforms as you run further. Check out how can you go past each of them in the table below. You must be wondering how to convert Ben into alien. Well, it’s pretty easy. All you have to do is collect the omnitrix icon and you will be converted into one of the aliens i.e. Crashhopper, Cannonbolt or Armodrillo. To score better in the Ben 10 Undertown runner game, these alien forms will help with their superpowers too! So, you know what to do. Pro Tip: Apart from running through the undertown, you must collect the green colored orbs to earn extra points. The more you collect them, the higher will be your score. So, all you ben 10 fans, are you ready to start this chase? Remember, you aim is to beat the highest score and you are your own competitor here! Run, Jump and Dodge the obstacles of the alien Undertown to become the Highest Scorer! Don’t Forget to give your rating for Ben 10 Undertown Runner and share your tips and tricks to win this game in the comments section below.